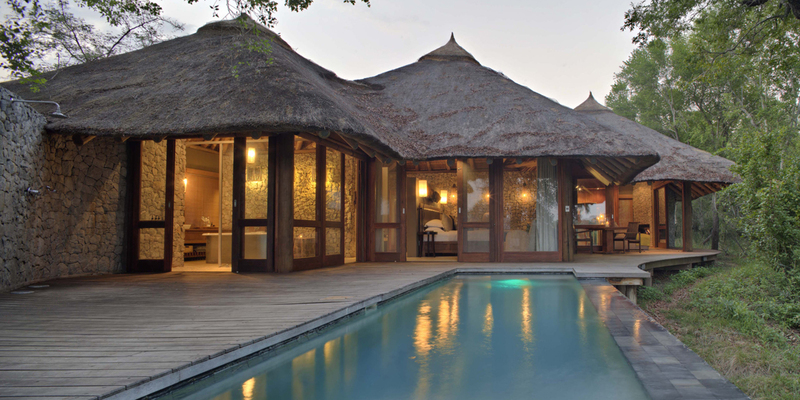 The intimate and luxurious Leadwood Lodge, located in the fantastic Sabi Sands Game Reserve in Mpumalanga, is the perfect choice for friends or family sharing an African safari experience without intruding on each other’s privacy. 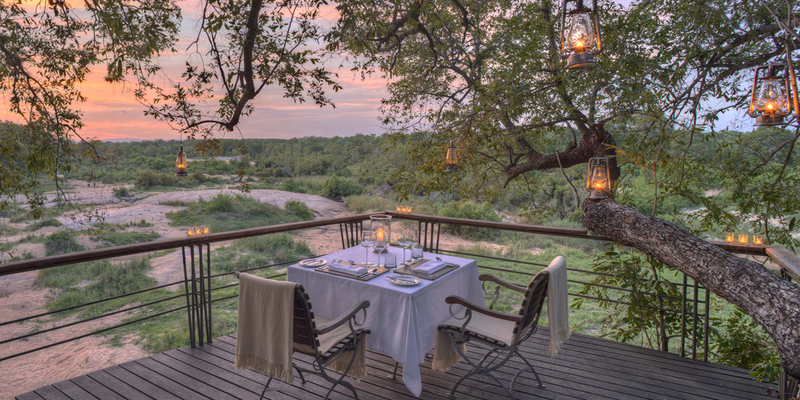 Nestled under a canopy of jackalberry and leadwood trees close to the confluence of the Sand and Mabrak Rivers, Leadwood Lodge offers a peaceful and serene getaway in an area famous for its unrivalled wildlife. Consisting of four beautifully decorated suites, this exclusive lodge can be booked either for individual use or sole-use for a small group of family or friends. 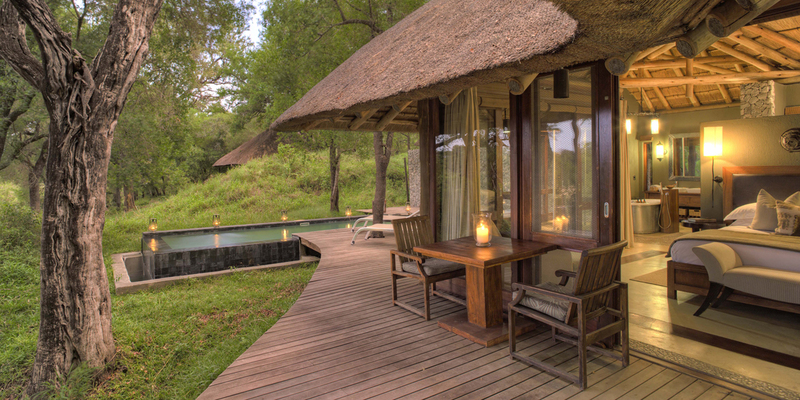 It is also a fabulous option for honeymoon couples looking for a more romantic and private safari experience. 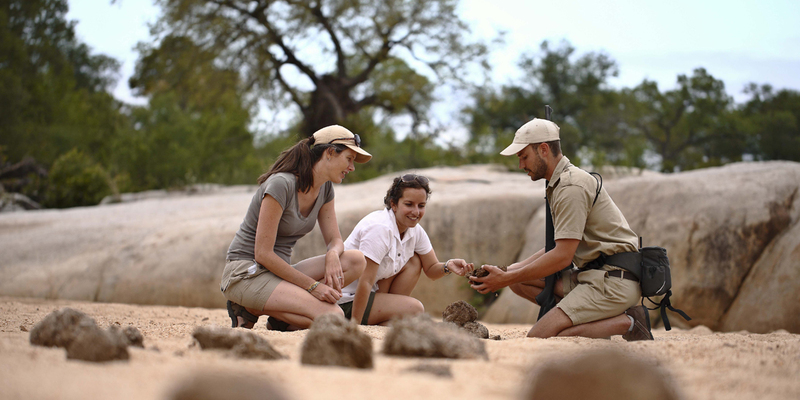 When Leadwood Lodge is taken exclusively for sole-use guests can enjoy a private ranger, tracker, butler, chef and exclusive use of an open safari vehicle. The Sabi Sands Game Reserve in the greater Kruger National Park is renowned for its exceptional ‘Big Five’ game-viewing given its rich soils which produce excellent grazing habitats. Guests at Leadwood Lodge have the opportunity to spot many amazing animals such as spotted hyena, various antelope, elephants, giraffe, white rhinos, lions, buffalos, hippos and leopards. Africa’s most impressive wildlife can be viewed on morning and afternoon/evening game drives in open safari vehicles accompanied by expert guides and Shangaan trackers. Game drives navigate an area of ten thousand hectares and a strict vehicle limit at sightings ensures exclusivity. Off-road driving allows guests to have the best possible views of any exceptional sighting and rangers are constantly in touch with each other to keep track of animal movements. Thrilling evening drives provide an opportunity to glimpse seldom-encountered nocturnal species. Guests at Leadwood Lodge can also enjoy informative guided bush walks with excellent bird watching, accompanied by an armed ranger sharing his vast knowledge of the local fauna and flora. 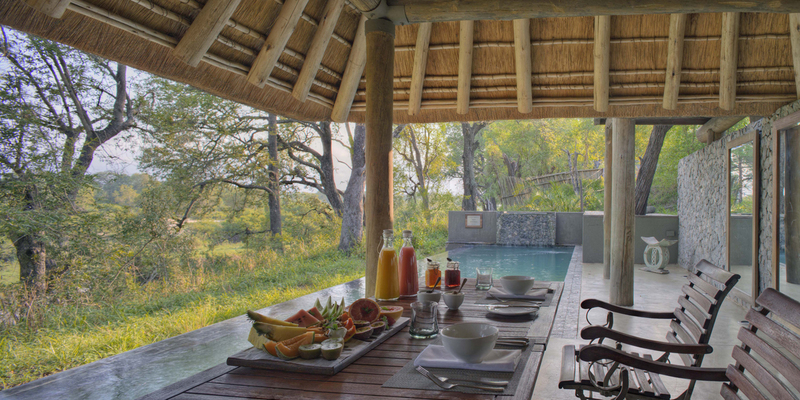 Guests can absorb intimate details of the bush; from the intricate weave of a spider's web, to the bright plumage of local birds and the piercing calls of various small creatures. At an additional cost, guests can experience a spectacular helicopter flight; soaring over cascading waterfalls and along the escarpment, landing at a magnificent viewpoint at Blyde River Canyon to enjoy a delicious picnic before returning to the lodge. Constructed predominantly of granite and glass, nestled against a well-wooded bank and perfectly secluded for maximum privacy, Leadwood Lodge’s guest accommodation comprises four lavish and spacious suites ensuring total serenity and solitude. Each luxurious suite exudes chic opulence and features air conditioning, an open fireplace for the colder months, a huge bathroom with free-standing bath, under-floor heating and large walk-in shower. Floor to ceiling glass windows lead out to a private infinity pool encircled by an expansive wooden deck, and a refreshing outdoor shower all offering superb views. The combination of crushed stone, rough granite, dark meranti wood and glass all contribute to the stylish design. 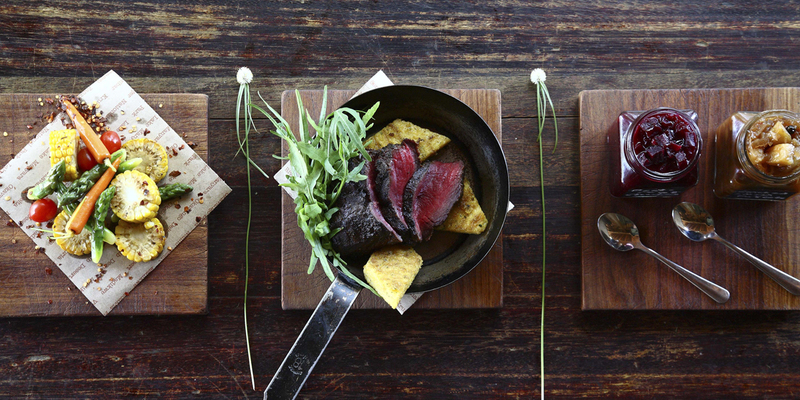 The main dining and lounge areas are elevated and boast dramatic views over the rivers. 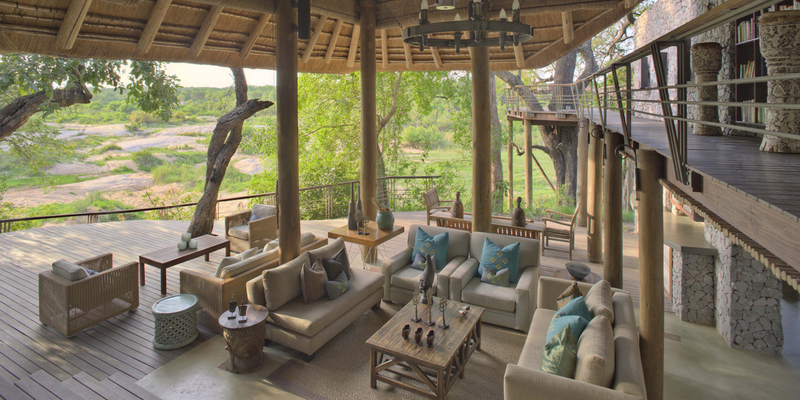 Leadwood Lodge’s ingenious use of steps and different levels of decking have created intimate spaces for quiet game-viewing or relaxing. For those guests wishing to share their experiences, there are cosy and comfortable communal spaces. 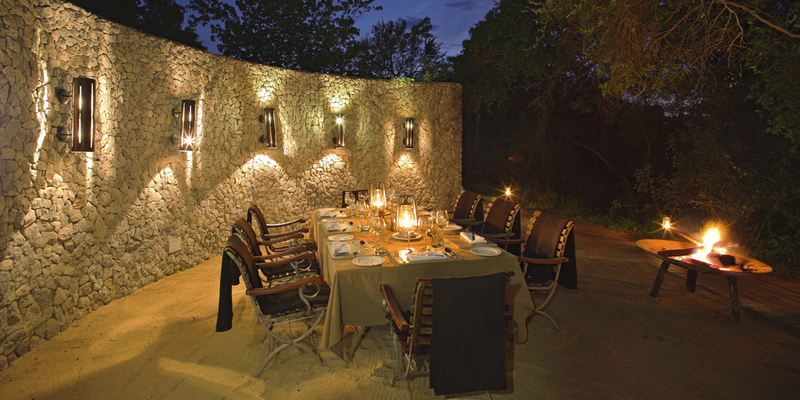 Dinner is offered in enchanting settings, either on the open deck under the boughs of a magnificent jackalberry tree or in the boma around a roaring fire.